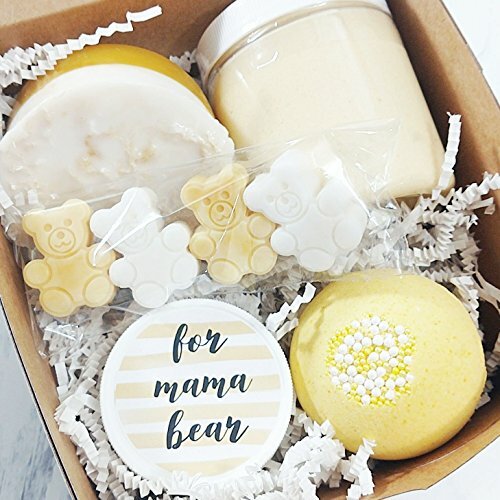 Our Mama Bear spa gift set is the box to gift to all the moms who need some pampering. We scented each bath item in our all time favorite comforting scent blend of honey bunny. Soothing notes of bergamot, sweet orange, and crisp apple, rich, golden honey nectar, toffee bits, and drop of white ginger musk. We would describe it as a grown ups snuggle blanket. So whether you are looking for a gift for a brand new mommy to be or maybe a mom of teenagers, this is the 5 piece bath gift set they will adore. Unique, handmade curated bath gift sets are what we are all about. Shop our entire line up for everyone on your gift giving list. If you have any questions about this product by Sunbasil Soap, contact us by completing and submitting the form below. If you are looking for a specif part number, please include it with your message. Invigorating yet gentle face and body poufs. Hand crocheted pink calico colored spa/bath set. Set includes nubby washcloth, soap saver, and reusable facial scrubbies.